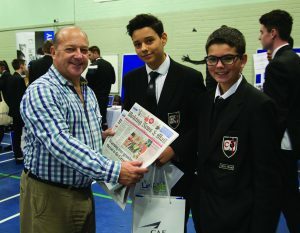 ARMED with preparation work and questions at the ready, students at The Winston Churchill School made the most of the chance to delve into future job opportunities as part of their Careers Fair. The second event of its kind staged by the Woking school saw a wide range of local and national companies, as well as colleges and universities, in attendance last week. Over 900 students from Years 9 to 11 visited the companies and training establishments, firing questions and keeping the visitors extremely busy. After school, parents were invited along with the year 7 & 8 students. Attendees included representatives from multi-national technology company Dell, The Royal Surrey Hospital, Woking News & Mail and Toadhall Nursery to Linkable and the Woking & Sam Beare Hospices. Training establishments included Woking and Farnborough colleges, Pulse Football Academy, The University of Surrey and Tante Marie. “The Careers Fair was a great success, providing an invaluable experience for all of our students,” said headteacher Zoe Johnson-Walker. The Winston Churchill School puts a lot of emphasis on preparing students for careers, helping them focus on the skills required for future employability. Each year students are involved in the Young Enterprise Scheme, plus numerous enterprise challenges. Small specific workshops have been staged by professionals, Oxford University and past students, and many pupils visit other educational establishments throughout the year. Any companies interested in becoming an exhibitor at the school’s next Careers Fair should contact m.merryweather@wcsc.org.uk.